Christmas songs are playing, lights are shining, cozy sweaters and hot chocolate by the fire. Yup! December is finally here and I’m in full holiday mode! This year, I’ve been having a lot of fun decorating with my family. From putting up the Christmas tree to creating little crafts that add a personal touch—it’s definitely fun watching my daughter’s face light up with all the holiday excitement. 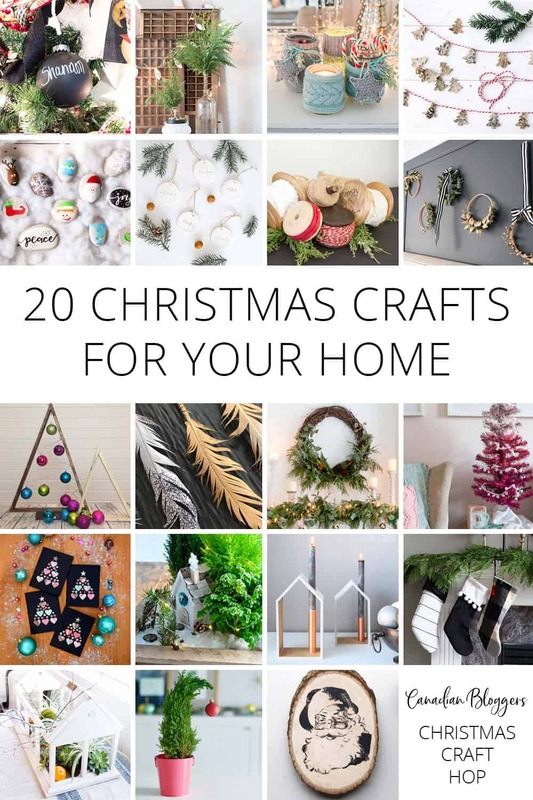 Today I’m teaming up with 19 other fellow Canadian bloggers to showcase some awesome Christmas craft projects that you can do this holiday season. Be sure to check out the rest of the project links at the bottom of this post. When creating a holiday atmosphere, candles are always a must. I love the dose of warmth it provides during this cold season. My project stems from an old Christmas favourite. I wanted to recreate a simplified version of a Christmas village home by adding a Scandinavian twist. It’s chic, super easy to make, budget-friendly and it can be customized to match any holiday decor. 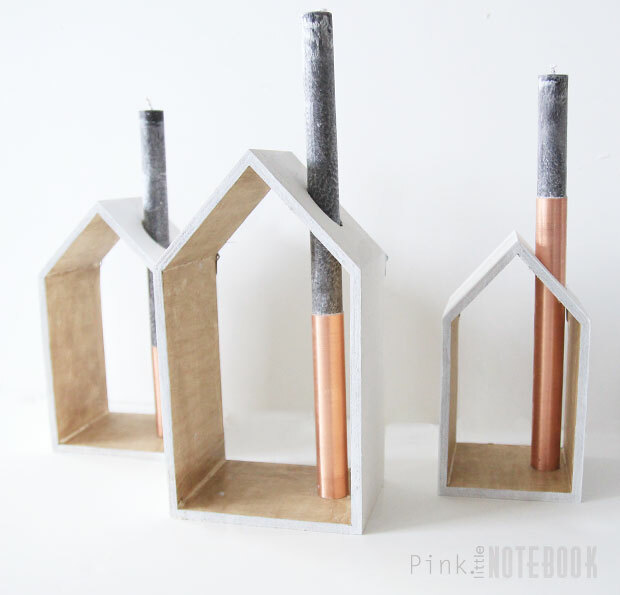 Here’s how you can create your own Holiday house candlestick holder! Assembling a house silhouette is fairly easy. It requires a few cuts and some glue but for those who would rather skip this part, I found an even easier route—buy pre-made ones! 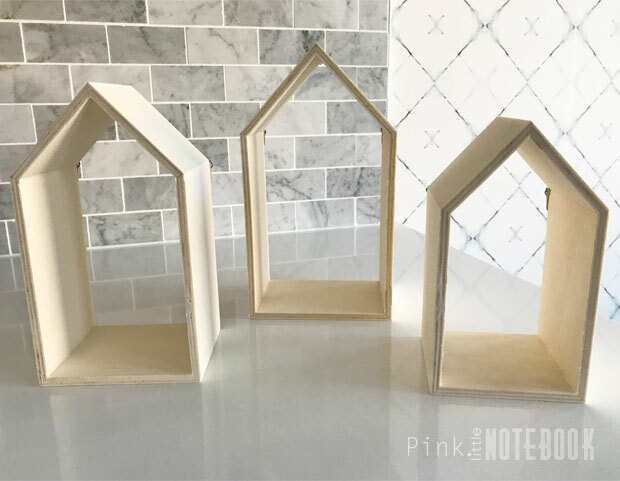 I found these wood houses in a variety of sizes from the Dollar Store. 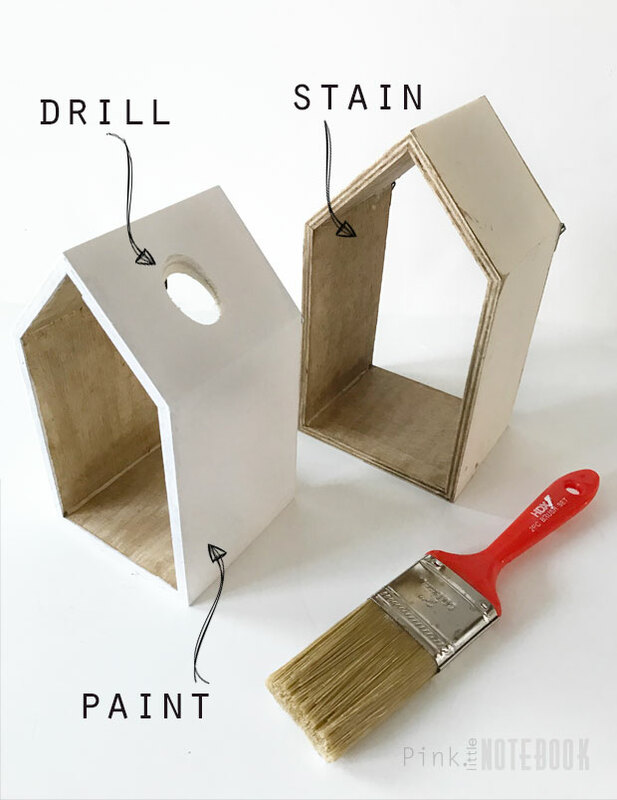 Since these little houses are wood, you can transform them anyway you like. My Christmas decor is fairly neutral so I went with a stain for the interior and a white coat of paint for the exterior. You will need to drill a hole on the roof, which will hold the candlestick. I used a 1″ hole saw and centred the hole to resemble a chimney. Next I took scrap pieces of 3/4″ copper pipe in different heights to use as the base for the candlesticks. To secure the candlestick to the copper, I just screwed the candle into the pipe. 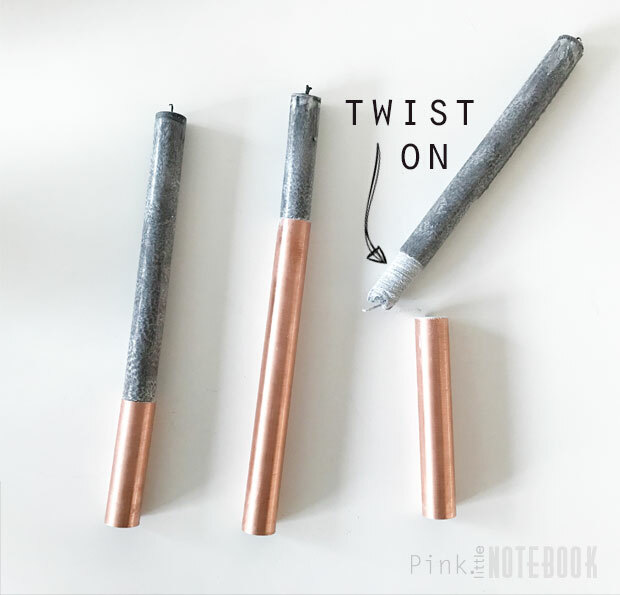 By doing this you will be shredding a thin layer of the candle wax, which will make a snug fit into the pipe. 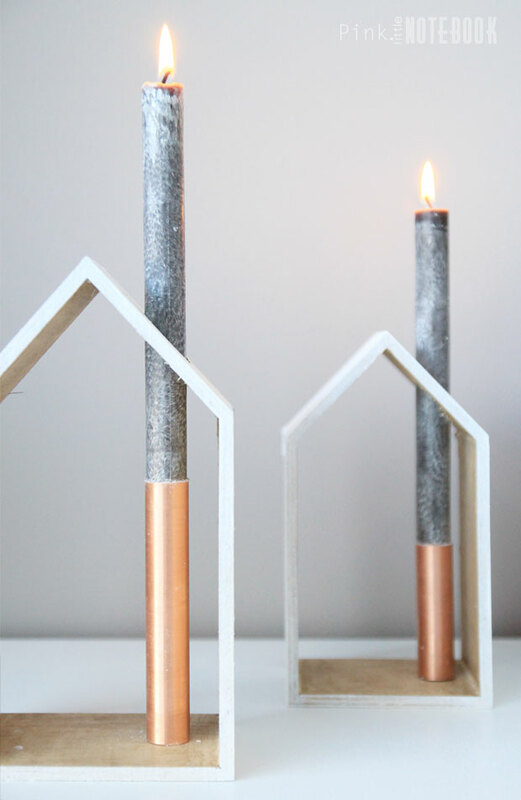 Last but not least, take your copper candlesticks and anchor them into the hole you just drilled. They do stay put, but for added security, you can add a little hot glue to the bottom of the copper pipe. For more Christmas craft inspiration, be sure to check out these fun projects from my talented Canadian blogger friends! These are beautiful Sabrina! I would want to keep them out all year round! That is the cutest project! These are beautiful Sabrina! I’m gonna try these. These are my faves!!! Absolutely so stylish, clean and modern! I love these and I would totally leave them out all year! I love these. 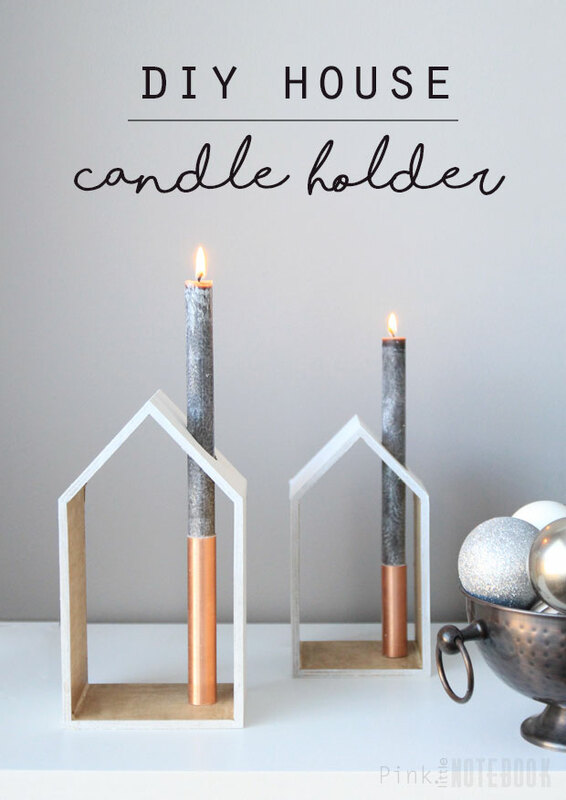 They’re so simple and scandi -perfect for Christmas! I love this craft! So simple and modern chic.